Kinston, N.C., Jan. 5. – Fire in the large brick building owned by Dr. A.R. Miller, located on South Queen Street, about 6 o’clock last evening, caused a loss of from eight to ten thousand dollars. The flames were just under the metal roof – a very hard place to reach with water. The fire burned steadily until about 9 o’clock before the firemen had gotten it under control. The stocks of the several stores under the building were practically ruined by the water. 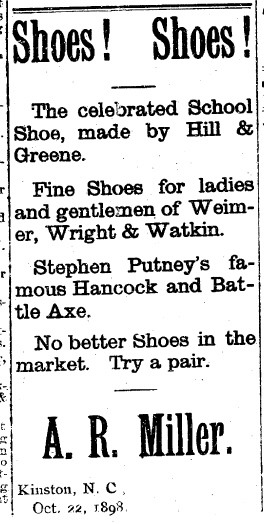 Source: “Fire In Kinston.” Times-Dispatch [Richmond, VA] 6 Jan. 1904. Chronicling America. Library of Congress. <http://chroniclingamerica.loc.gov&gt;.